Two billion people globally have been infected with hepatitis B (HBV), and approximately 350 million are chronic carriers, including approximately 750,000 persons in the US. Among the chronically infected, 15% – 40% will develop cirrhosis and/or hepatocellular carcinoma. Each year approximately 5000 people in the US and 1 million worldwide die from cirrhosis, liver failure or hepatocellular carcinoma resulting from HBV infection. Currently available therapies include peginterferon and nucleotide derivatives. These therapies have several important limitations, most notably that they do not get most patients to viral load and other biomarker-related treatment targets. Used in combination, they fail to provide better results than are obtained with the individual agents. The development of a third drug class would potentially offer the first opportunity for meaningful combination therapy of the type that has found success in the treatment of HIV and HCV. Arrowhead Therapeutics (ARWR) is developing ARC-520 as a novel, RNAi-based approach to the treatment of HBV. The product is based on Arrowhead’s proprietary DPC RNAi delivery technology, and incorporates two oligonucleotides that target highly conserved regions of all five of the mRNA’s produced by HBV. This approach potentially interferes with the production of ALL of the viral proteins, as well as the stability of the pre-genomic RNA that the virus uses as a template for DNA synthesis. While nucleosides, the most commonly used therapeutic class for HBV infection, exert their effects primarily through inhibition of viral replication, ARC-520 is claimed to have a dual mechanism of action, both reducing viral replication and restoring the immune system’s ability to clear the infection from hepatocytes. According to the company, this combination of repressed viral replication and enhanced immune response should lead to a “functional cure” of hepatitis B infection in most patients. Given the availability of cheap, generic anti-HBV nucleotides, the direct anti-viral replication activity of ARC-520 will provide a commercial opportunity only if that activity is substantially greater than or additive with that of nucleosides in man. Unfortunately, the available animal data do not allow one to make a firm prediction regarding either possibility. Reverse transcriptase – This enzyme serves to synthesize viral DNA from an RNA template, some of which is incorporated in viral particles for release into the bloodstream, and a much smaller portion of which is sent to the nucleus to replace degraded viral DNA and maintain infection of the source hepatocyte. HBsAg – A viral protein found on the surface of both HBV infectious viral particles (virions) and “dummy” virus particles that contain no viral DNA. The non-infectious particles are produced in a ratio of up to 1 million fold relative to infectious viral particles, probably as decoys to confound the immune response of the host and/or that of potential new hosts who are exposed to contaminated blood. The course of infection is most conveniently followed by measuring levels of the viral proteins HBeAg and HBsAg in the bloodstream. Serum viral DNA levels are less widely used for this purpose. The protein markers are more useful because they are correlated with hepatic viral DNA burden. In contrast, the correlation between serum viral DNA levels and hepatic viral burden breaks down in patients treated with nucleoside derivatives. These agents directly inhibit the synthesis of viral DNA, and since the half-life of hepatic viral DNA is much greater than that of infectious (DNA-containing) viral particles in the bloodstream, viral DNA levels are reduced much more rapidly in the serum (weeks) than in the liver (years). Reduction of HBeAg in serum to undetectable levels. Patients with undetectable HBeAg typically have low or undetectable levels of viral DNA in their serum as well, though HBsAg is usually still detectable. The achievement and maintenance of this benchmark is associated with a significantly lower risk of cirrhosis and hepatocellular cancer. Patients who achieve HBeAg negative status during treatment with peginterferon or a nucleoside can usually stop therapy without reverting to HBeAg positive status and with minimum risk of viral rebound. One year’s treatment with peginterferon produces HBeAg seroconversion in about 27% of patients and HBsAg seroconversion in about 2%. Due to its severe side effects, longer treatment is not ordinarily conducted. About 40% of nucleoside-treated patients achieve HBeAg seroconversion within 4 years, and about 5% achieve HBsAg seroconversion within 2 years. Combination therapy with peginterferon and a nucleoside does not give superior results to monotherapy. According to company presentations, the key factor differentiating ARC-520 from existing HBV treatments is its dual mechanism of action: inhibiting viral replication and enhancing hepatic viral clearance by reversing HBV-induced immune suppression. The former effect is proposed to arise from ARC-520’s ability to reduce hepatic levels of reverse transcriptase and pre-genomic RNA. The latter effect is proposed to arise from ARC-520’s ability to rapidly and profoundly reduce serum levels of HBsAg, which the company believes is a key factor limiting the immune system’s ability to clear HBV from the liver. The company proposes that this dual mechanism of action holds out the promise of a “functional cure” for HBV. The dual mechanism of action proposed by the company is unlikely to be confirmed in clinical trials. As demonstrated in the Figure below, stable HBsAg levels are seen in patients with a >4 log range of baseline HBsAg levels. The Figure also shows that most patients who experienced a rapid HBsAg decline upon initiation of tenofovir therapy came from the quartile with the highest baseline HBsAg levels. Lastly, there is no apparent threshold value of HBsAg below which the decline accelerated. In fact, careful examination of the figure shows several patients whose HBsAg levels dropped rapidly to a low value and then stopped declining. Although in vitro experiments conducted using T-cells from patients chronically infected with hepatitis C show signs of exhaustion very similar to those of T-cells from HBV patients, extended suppression of viral antigens in HCV does not lead to a robust immune response and viral clearance. In the INFORM-SVR trial examining the efficacy of 24 weeks treatment with danoprevir, mericitabine, and ribavirin, over 60% of genotype 1a patients having undetectable viral load at Week 2 experienced relapse when treatment was discontinued at Week 24. In spite of profound suppression of viral antigens for 22 weeks, their immune systems failed to clear the infection. Studies of T-cells from HBV patients who have had undetectable HBsAg levels for many years still show dysfunctional responses to viral antigens that are restored only after ex vivo expansion. Other studies have suggested that chronic exposure to high viral antigen levels produces permanent changes in the T-cell’s ability to produce IL-2 and TNF-α. Overall, the concept of T-cell exhaustion in the maintenance of chronic viral infections seems well-established. What seems less established is whether reversal of viral tolerance requires reducing viral antigen to lower levels than can be achieved in vivo in advance of complete viral clearance by other means, whether it can be accomplished in a therapeutically relevant time frame, or whether it is reversible at all. The sum of clinical data seems to suggest that one or more of these questions must be answered in the negative. Patients with HBV do not seem to respond to antiviral therapy in a highly HBsAg level-dependent manner, and to the extent to which their response is HBsAg dependent, it appears to be in the opposite direction from that assumed by Arrowhead. The company’s predictions of a functional cure confuse correlation with causation. As major medical society treatment guidelines point to undetectable HBsAg levels as the most desirable possible outcome of HBV treatment, it sounds very natural to suggest that a drug that drives HBsAg to undetectable levels will provide favorable patient outcomes. However, the current guidelines are based on the use of drugs that reduce HBsAg levels by an indirect route. In peginterferon- and nucleoside-treated patients, improved patient outcomes and reduced serum HBsAg levels are both driven by gradual reduction of the hepatic viral load. Patients don’t experience lower hepatic viral load and improved outcomes because their HBsAg levels drop. They experience lowered HBsAg levels and improved outcomes because their hepatic viral load drops. The evidence comes from Arrowhead’s own experiments, in which reducing HBsAg for more than 30 days by a mechanism independent of hepatic viral load has no long-term impact on the course of the infection. ALL serum biomarkers of HBV infection returned to baseline values after the drug wore off. Put another way, HBsAg levels and patient outcomes are correlated because both are driven by and correlate with hepatic viral load. A good analogy is provide by cancer therapy. In these patients, pain correlates with tumor size, but the reduction of pain that occurs when the patient is given morphine does not imply tumor shrinkage or confer an improved prognosis. 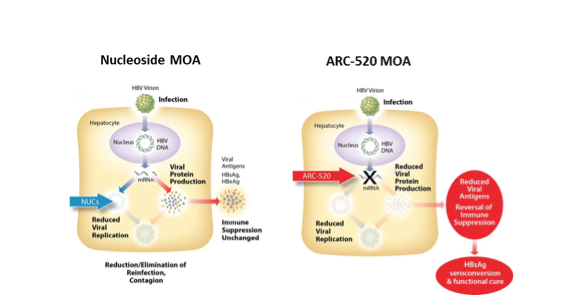 Given the availability of cheap, generic anti-HBV nucleotides, the direct anti-viral replication activity of ARC-520 will provide a commercial opportunity only if that activity is substantially greater than or additive with that of nucleosides in man. The available animal data do not provide a firm prediction regarding either possibility. While I am skeptical of the claimed immune reconstitution properties of ARC-520, its ability to inhibit viral replication in animal models seems clear. However, in order for an expensive, intravenously administered RNAi drug to compete with cheap, generic, oral nucleosides, it will have to demonstrate either significantly superior antiviral activity or antiviral activity that is meaningfully additive to that of nucleosides. Unfortunately, the animal data do not permit a firm prediction to be made regarding either of these criteria. In a head-to-head comparison with the nucleoside entecavir, 4 mg/kg ARC-520, 0.1 mg/kg entecavir, and a combination of the two provided log10 serum viral load reductions of 2.2, 2.5, and 3.2 respectively. Recognizing the very substantial limitations of the mouse model of human HCV infection, the best data available points to similar anti-viral potency for ARC-520 and entecavir, and suggests that the combination provides less than a 1 log improvement in serum viral load relative to entecavir alone. That being said, the error bars on these numbers are fairly wide, and it is just a mouse model. It seems quite possible that a more additive profile could be seen in the clinic. In March of 2013, Arrowhead reported results from a study of a single HBV infected chimpanzee treated with a total of 5 mg/kg ARC-520. Serum viral DNA, HBsAg, and HBeAg were each reduced by only about 0.6 to 1.2 log10 units. The animal was reported to experience an ALT flare coincident with the HBsAg nadir, a result which the company attributed to reactivation of the immune response associated with reduced HBsAg levels. The company has rationalized the modest effects seen on serum viral load, HBsAg, and HBeAg in this model as arising from an unusually treatment-resistant profile of this particular animal. Certainly the present of a single base mismatch to one of the two ARC 520 oligos that the company reports is relevant here. However, there does not seem to be any consistent evidence in the literature to support the company’s suggestion that the animal’s prior exposure to other drugs, its high baseline viral load, its high serum levels of viral antigen, or its high liver viral load would be predictive of a modest impact of treatment on serum or antigen viral load. Given the wide range of HBsAg levels seen in patients with stable, chronic infection, it seems unlikely that the ALT spike seen in the chimpanzee is best explained as immune reconstitution from a 0.5 log reduction in HBsAg. Alternative explanations may be a delayed response to a prior drug withdrawal, or the rapid increase in infectious viral particles that occurred 10 days prior to the flare. ALT spikes can be cause by increased antigen load and are not necessarily immune reconstitution events. In the investor call of December 18, 2013, the company stated that its phase 2a trial in Hong Kong will be a single-dose study conducted in patients on chronic nucleoside therapy, will examine loss of HBsAg as the primary endpoint, and will enroll only HBeAg-negative patients. On the February 14, 2014 call, the company further elaborated that it expects most of the patients enrolled in this trial to have undetectable serum viral load. Thus HBsAg, which I have argued is probably therapeutically irrelevant, will be not only the primary endpoint of the trial, it will likely be the only measurable endpoint. The Phase 2b trial planned for the U.S. will examine HBsAg levels and serum viral DNA levels in both HBeAg positive and HBeAg negative patients. It is worth noting here that the first approvals in both the interferon and nucleoside classes were based on pivotal trials in which the primary or co-primary endpoint was liver inflammation determined by biopsy. It is likely that the FDA will require a similar direct outcomes measurement in an pivotal trial of ARC-520. Based on the potent HBsAg lowering ability of ARC-520 seen in preclinical studies, the designation of HBsAg lowering as the primary endpoint of the Phase 2a trial, and the fact that other traditionally used biomarkers of HBV infection will likely be unmeasurable in the patient population selected for the phase 2a trial, it seems very likely that the trial will have a nominally positive outcome. I expect the stock to continue to run up through and after the binary event. In the longer term, ARC-520 will have to prove its ability to impact disease progression, an outcome for which I have argued that HBsAg measurement is probably irrelevant. A reasonable approach to this stock may be to go long through the binary event, taking advantage of the share price increase in the aftermath of the trial’s apparent success. However, unless the company announces additional endpoints that are more indicative of a success that can be translated into FDA approval, it seems prudent to be cautious about holding beyond the announcement of the initial results. Overall, my recommendation is to seek to take advantage of the upside associated with near term trial results, and over the long run of the very attractive potential of Arrowhead’s RNAi delivery technology. But along the way, don’t get caught in a vulnerable position with respect to the company’s expectations for ARC-520, which I believe may be overly optimistic. For those interested in a more detailed analysis of this and other RNAi delivery technologies, I strongly recommend Dirk Haussecker’s RNAi therapeutics blog and industry reports available for purchase through that site. HBV DNA is also known to integrate into the host chromosome to some extent, but this integrated DNA is thought to be incapable of directing viral replication. While the failure to achieve a target value of serum viral load, HBsAg, or HBeAg as a result of treatment would be expected to be highly dependent on baseline values of these variables, there is no clear evidence in the literature than the magnitude of the drop of any of these variables in response to treatment is a function of its baseline value.